Trump Loves Squash – Official! Millionaire UK political party donor Arron Banks has been forced to apologise to squash clubs throughout the world by US President Donald J. Trump, unnamed sources have claimed. Banks had complained that the UK Independence Party was “being run like a squash club committee” implying that it was dedicated to promoting social interaction, public health and personal well-being through sports participation rather than peddling fake news and alternative facts to racist, misogynistic and gullible people. As part of a well-rehearsed and finely-nuanced statement, he had also accused UKIP’s sole MP, Douglas Carswell, of treachery in not doing enough to help former leader, Brexiteer and fellow millionaire Nigel Farage, get a knighthood. Later, asked to expand on his comments, Banks threatened to set up a rival political party that would “destroy” UKIP unless he was made party chairman. However, it has since emerged that news of Banks’s crie de coeur may subsequently have appeared in the Twitter feed of the billionaire US President. 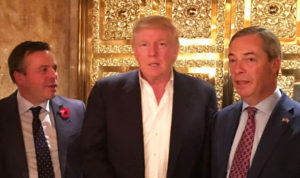 Outraged at the millionaire donor’s views on squash clubs, Trump is alleged to have alerted fellow sports enthusiast and rumoured squash buddy Farage, possibly urging him to take out Banks “with extreme prejudice”. 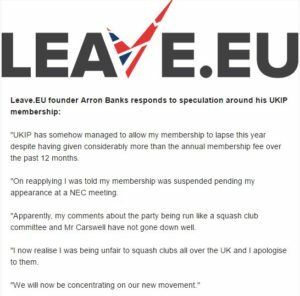 Within hours, Banks had issued an apology to “squash clubs across the UK” for his comments about the way in which they were being run, including how they elect committee members, welcome newcomers or plot with enemy powers. At the time of writing, however, it is not known whether President Trump, rumoured to be addressed as “Sir Donald” by members of his administration, regards Banks’s apology as sufficient as it does not apply to squash clubs either in the US or in Russia. Thanks to The Daily Telegraph, The UK Bulletin, Leave EU Official, The BBC, Wikipedia, and Twitter. This entry was posted in Squash and Politics, Squash and the Arts, Squash Communities and tagged off the court, squash court, squash players by Peter Heywood. Bookmark the permalink.